This was The Station on their opening day in May last year. Photo by Wendi. 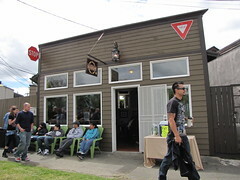 The Station coffee house on 16th Ave. S. is celebrating its first year in business with a free all-ages anniversary party, on Sunday evening (after Beacon Rocks!) from 5 p.m. until dusk. The party will feature DJ 100 Proof, WD4D, King Khazm and 206 Zulu, Hollis, Amalala, Side Pony, Khingz, Waves of the Mind, and more, including an open mic. There will be be a variety of alcoholic beverages for those 21+, and lemonade, Italian sodas, and coffee drinks for those younger. The Station is located at 2533 16th Ave. S., just north of Beacon Hill Station, and across the street from El Centro de la Raza. Just talk to Geo The M.C from Blue Scholars and he told me that he will be here to perform!! Great news for The Station! great news for Beacon Hill!! see you all here this Sunday! Thanks for the pictures, Dan! They are wonderful! That was the coolest thing I have ever seen on Beacon Hill. Those photos make me so sad I couldn’t make it. Looks like a great time! Hope this and the Beacon Rocks Festival all went great! Geo from Blue sholars gave The Station and Beacon Hill alot of LOVE!